As my fellow Migraine Warriors and I gear up for Migraine & Headache Awareness Month 2014, I’ve been ransacking my house and my surroundings for things that are purple. Why purple, you ask? Those of you who know me know that purple is my favorite color. 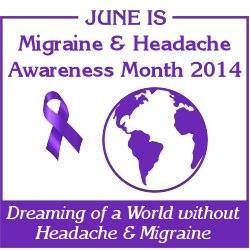 It delightfully also happens to be the color for Migraine & Headache Awareness! (I think this may be the only time I’ve ever used the words “migraine”, “headache”, and “delightfully” in the same sentence.) At any rate, I aim to make the color purple and the purple ribbon as synonymous with Migraine & Headache Awareness as the color pink and the pink ribbon are with Breast Cancer. For each of the 30 days in June, I will don something purple. One day will be purple Jamberry Nail Wraps on my fingernails, from my Migraine Fundraiser conducted with Megg Riley. Another will be my Migraine Awareness Survival Straps bracelet. Another will be the beautiful purple bracelet made by April Small and given to me on Valentine’s Day 2014 by my boyfriend extraordinaire Ian. My mom made purple earrings for the occasion. I have purple shoes, socks, shirts, purses, messenger bags…I will likely put purple flowers in my hair. Some of you may not understand my fixation on this. I get that, I really do. However, migraines are so misunderstood, so often dismissed, so easily pushed to the bottom of the barrel that just being recognized feels like a victory. Hopefully, after reading this post, some of you will wear purple, too, or at least begin to equate the color with Migraine & Headache Awareness. I know people don’t think that changing your Facebook profile picture or wearing a purple ribbon does anything for the cause. I think those people are looking at it the wrong way. By consciously choosing to display the color purple, in whatever way you choose, you are supporting me and my fellow Migraine Warriors. You are raising awareness. You are making an invisible disease visible. So dig out that purple bow tie you usually only wear on Easter. Stick some lilacs from the front yard into your ponytail. Slap on some purple lipstick. Grab a roll of purple ribbon from your local Dollar Tree or craft store. Help me and my 36 million Migraine Warrior friends show the world what the Power of Purple can do!